This is actually a painting I submitted as part of my original proposal in May 2011. It's a bit different from all the others because it is a more straightforward portrait and I was still figuring out my approach. A big thing in the school are the F1 racing teams. Not an actual car as I originally thought but a small air propelled race car, aerodynamically designed by the students on a CAD machine and carved from balsa using a computer guided cutter. The car is then varnished and wheels they have designed themselves added. All with a view to keeping the weight as low as possible. 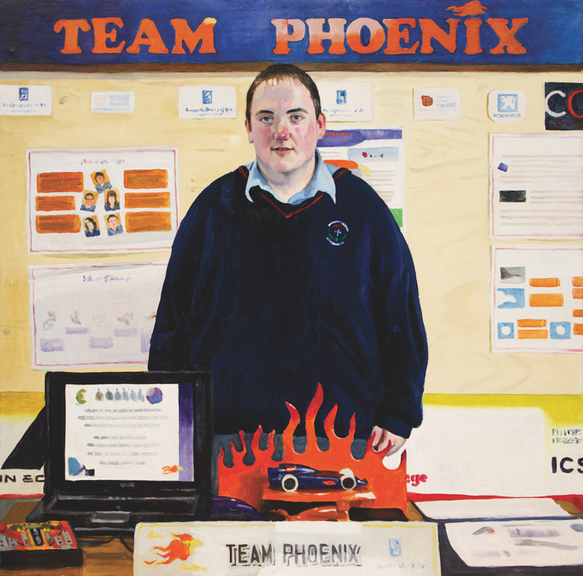 This year one team from the school is traveling to represent Ireland in Dubai having come second nationally. The competition is not scored on the car’s performance alone but also on the business strategy, marketing plan and so forth. They also have to build a display and Conor is standing behind his team stand along with their car.